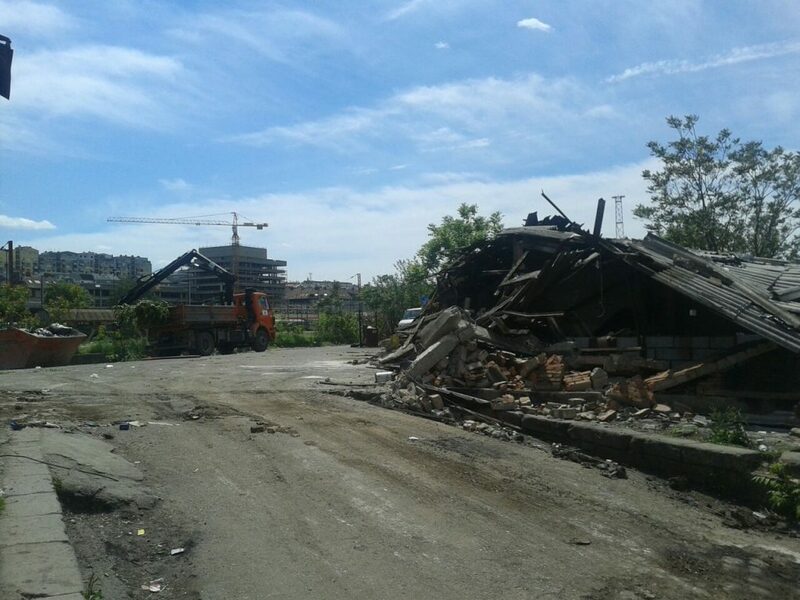 Belgrade, the 11th of May 2017: The day that the squatted warehouses behind the Busstation in Belgrade, commonly named as “barracks” were evicted and demolished. 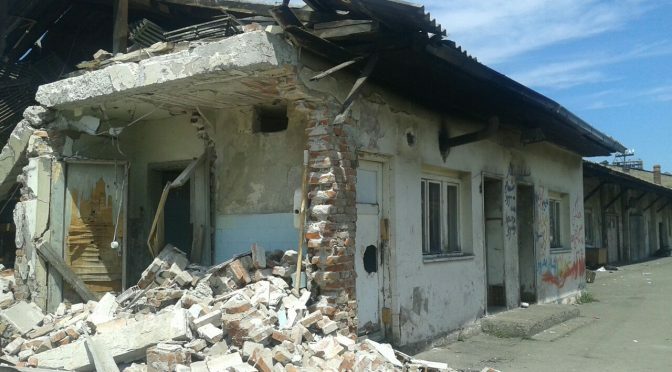 This eviction and demolition did not happen out of the blue but falls in line with a number of other developments in the Serbian immigration policy and the adaption of practices of neighbored states on Serbian territory. Therefore, this article aims at reporting on the eviction and demolition of the migrant squat in Belgrade and by doing so, reviewing these policies and practices in a broader frame of political developments. Just as the existence of the barracks is strongly connected to the restabilization of the European Border Regime, the demolition of the same is something that cannot be seen isolated from a broader international frame. In the following, I will outline the occupation of the warehouses as a consequence of tightening borders in the north (1), the situation in the barracks during winter until May 2017 (2), the chronology of the eviction (3), the psychological strategies that were used in the eviction (4) and expectations for further developments in Serbia in general, and Belgrade in particular (5). 1. The occupation of the warehouses: As a consequence of tightening borders in the north Belgrade is, at latest since 2015, an important transit point on the so called Balkanroute. Until summer 2016, even though Hungary already built a massive fence to protect its southern borders, migration through Serbia was relatively easy and most of the people transiting Belgrade just stayed for a couple of days to some weeks in order to rest, recover, organize and wait for fellow passengers. The main cause for this migration flow was, that the border to Hungary was indeed fenced off physically but Serbia just refused to take back third-country nationals under the existing readmission agreement, who actually made it on Hungarian territory. Therefore, there were no deportations from Hungary to Serbia, even so approximately 50 – 200 people per day crossed the border informally per day (see statistics on police.hu). This practice was also reflected in the policy towards migrants in Serbia: There was relatively little repression on people on the move without documents required for legally residing on the territory. This changed with the implementation of the so called 8km push-back law in July 2016, that formalized and legalized the push-back of every person, who crossed the border to Hungary informally and who was caught within an 8km corridor behind the border line. Having a massively militarized border to Serbia, this law was eventually feasible and led to thousands of people being violently pushed back by police (which also cooperates with the military and local citizen-gardes) and being stuck in Serbia until today. In February this year, the law was even enforced up to being implemented on the entire territory of the Hungarian state – even though in practice this makes relatively little difference, as in the implementation of the law the police conducted the push-backs on the entire territory anyway. Already been undertaken before on the southern borders of the Balkanroute (especially at the Greek – Macedonian border line), the practice of push-backs spread on the whole Balkanroute and is leading to an enormously difficult and rocky situation of migration. The south-western border to Croatia is not very much different to the Hungarian border when it comes to the practice of push-backs and violence. Geographically the 2/3 of the border is already territoriality guarded by the Danube, impossible to cross without a boat and the other 1/3 being mountains and former mine area. Apart from that, also the practices in Croatia draw the very same pictures: people being beaten up, robbed and pushed back to Serbian territory. Still, this is the most beaten track at the moment and hardly anyone is trying to cross into Hungary anymore. People in the barracks reported of having tried to cross to Croatia up to 30+ times without success. Only those who make it to Zagreb, approx. 300km from Sid, end up with some chance of being accepted in a center in Croatia. As with the even more closed and secured borders prices for trafficking rised, many people got stuck in Serbia with no other choice than either just waiting, hoping for a positive asylum decision in Serbia (which are still quite rare) or trying to cross to Croatia (and sometimes Hungary or Romania) again and again. As a reaction to the numbers increasing day by day and to government changes in Serbia, in July 2016, a massive police action led to the eviction of the parks in downtown Belgrade and thousands of people were registered and taken to the camps (see the report Recent Repression on People on the Move in Serbia). But as people kept passing to Serbian territory, in August and September 2016 the numbers of people stuck in Serbia jumped to several thousands within weeks. Also, all of the camps, except Krnjaca, are located in very remote areas, it is relatively easy to escape. Therefore, many people were staying in Belgrade and soon the parks around the Busstation again became very overcrowded with people sleeping there every night. 2. The situation in Belgrade in winter until May 2017: Already by the end of August 2016, migrants started to occupy the empty warehouses behind the main trainstation in central Belgrade with only a few people even noticing it. What followed has been widely spread in the newspapers. Especially in January, when the temperature felt up to -15°C, the barracks in Belgrade attracted a lot of media attention and even more volunteers, national and international NGOs. It can not be denied that the circumstances were unlivable and inhumane, but yet these pictures also showed a very one-sided image of the life in the barracks. People living in the squat have been mainly victimized and presented as suffering individuals, but the barracks also have been a place where collective organizing, different forms of solidarity and exchange as well as communication and learning have become possible. Few people know about the level of autonomous organizing that has happened there: collective cooking, a self-organized language school, sports, discussions and exchange of knowledge, simply everyday life in unusual circumstances. The place has been under constant threat of eviction. People were always told to go to the camps and register – but still there were reasons why people stayed in Belgrade and did not deliberately go to the camps: connection, collectivity, solidarity, visibility, some sort of liberty. EU policies aim to maintain and further develop the Union as an area of freedom, security and justice. On issues such as border control, visas, external migration, asylum, police cooperation, the fight against organised crime and against terrorism, cooperation in the field of drugs, customs cooperation and judicial cooperation in criminal and civil matters, Member States need to be properly equipped to adequately implement the growing framework of common rules. Above all, this requires a strong and well-integrated administrative capacity within the law enforcement agencies and other relevant bodies, which must attain the necessary standards. A professional, reliable and efficient police organisation is of paramount importance. The most detailed part of the EU’s policies on justice, freedom and security is the Schengen acquis, which entails the lifting of internal border controls in the EU. However, for the new Member States substantial parts of the Schengen acquis are implemented following a separate Council Decision to be taken after accession (source). The visibility of suffering migrants in the city center – which were portrayed by hundreds of articles in January 2017 when temperature dropped to -15°C – are thus not very supportive. Similar to the eviction of Idomeni, in the end conducted by a left government, pictures of suffering and of protest should not something to be seen for too long in public sphere. Rather, the practice that goes in line with EU practices – basically everywhere – is accommodating or even detaining people in camps in remote areas in order to invisibilize and immobilize people on the move. Something that is done by the Serbian government now, too. What must not be forgotten is also the ground that these barracks were standing on and thereby depicting the contradictory politics of the city they were located in: Belgrade (and its) Waterfront (BW). BW is a high-end financial investment project that leads to the gentrification of the Savamala district, the area around the central bus- and trainstation. Thereby, the land was already under lease (for very little money) to the investors, the evictions of the barracks only a matter of time. The connection between the project BW and the issue of migration has been intertwined already since longer. For instance, in April 2016 there was an eviction and demolition of migrant’s infrastructure: namely Miksaliste and the No Border Hostel (for further information on Miksaliste and the No Border Hostel and their eviction see MovingEurope). 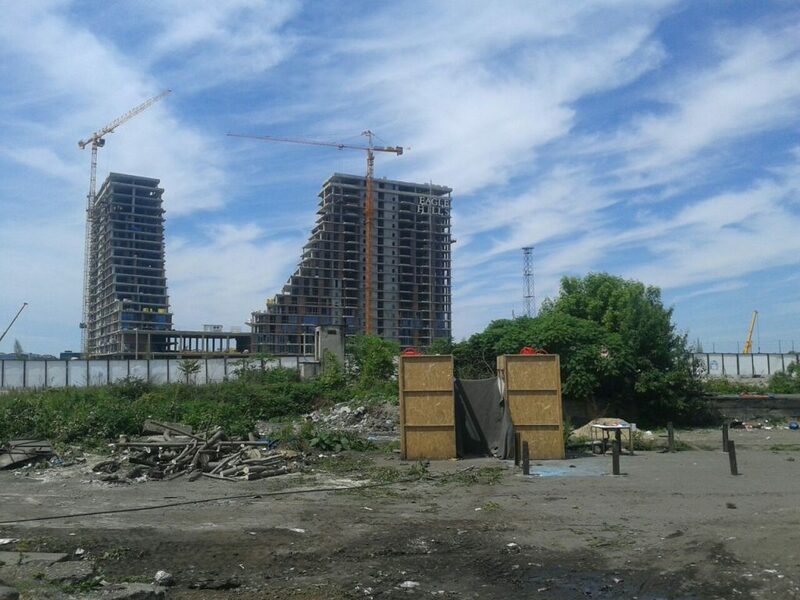 With these and other violent evictions the Savamala district, there have been mass demonstrations and protests under the name of “Ne da(vi)mo Beograd” (don’t drown Belgrade) and the whole project is very controversially discussed and confronted by a right to the city movement. Therefore many people living in the houses and some activists were already prepared for an eviction to happen, but the way it was effectively done in the end touched much more layers of violence than just physical violence and invisibilization, respectively immobilization. 3. Chronology of the eviction: According to Nenad Ivanišević, State Secretary of the Ministry of Labor, Social and Veteran Affairs, the plan was to complete the eviction within 20 days, but in the end it only took 6 days to fulfill it. In the following, I will outline the eviction chronologically. The Ministry of Labor, Social and Veteran Affairs announced to relocate migrants who are staying in Belgrade to the reception centers all over Serbia and to consequentially evict and demolish the barracks behind the busstation. It was announced that “force will not be used to transfer migrants” – instead they will be offered, “in a humane manner” to move to a reception center (source). Indeed, there was relatively little physical violence used in the eviction. But the psychological violence that people were facing was outstanding. There was a weekly assembly of independent volunteers who were organized in the barracks. As most of the people and groups at place were coming from a humanitarian background and did not perceive their work as political, this assembly was mostly serving the purpose of coordination of tasks, volunteers and information. When on the 5th of May the Ministry of Labor, Social and Veteran Affairs announced to relocate migrants who are staying in Belgrade to the reception centers all over Serbia, the Commissariat (state agency for migration and refugees) had called for a meeting with this assembly to coordinate the eviction with the volunteers. They were told that the papers that are used to register people in the different camps were given to the “White House”, a venue in the center of the barracks where (commonly known) the smugglers were living. On these lists, refugees could choose the camps which they will go to, an effective strategy to empty the barracks silently. This gives the impression that – although the Commissariat officially communicates that they are not cooperating with smuggling structures and aim at keeping those structures out of the camps – that there was an unofficial alliance between formal state structures and informal smuggling business. Furthermore, there were rumors that those who stay in the barracks the day of the eviction will be brought to Presevo on the border to Macedonia. In the Presevo region it is a widespread policy to push-back people to Macedonia. Therefore many people registered for the camps in the north, close to the Croatian border. Some people who lived in the barracks considered resistance against the eviction. Yet, the situation was very difficult to organize: there was conflicting information and confusion about legal and actual consequences of resistance, many of their fellows already left the camps and no group of supporters who was eager to fight and resist the eviction. Most of the people who established a relationship of trust to migrants over the course of the last months didn’t even consider the possibility of resistance. Many among the volunteers considered it even a good idea to send the people to the camps, seeing the provision of food and medical service bettering, but not the political side of invisibilization and immobilization behind it. Also there was neither a clear institution nor a concrete “enemy” to resist against. The day before the eviction, the barracks were sprayed with a toxic chemical. This was done in order to “clean” the barracks from scabies in favor of the workers who will come in the next day. As a video witnesses, people who were staying inside the Barracks were warned 5 minutes in advance but not told what the spraying was all about. Some people were sprayed, many aspirated it. At 7am in the morning, workers and Commissariat staff entered the barracks screaming, some of them held axes in their hands. People gave up from the first seconds, maybe even not considering to resist and it took about 30 minutes until the barracks were empty of people. About 400 people were present in the barracks that morning, even though it is very hard to get reliable numbers for this morning. They were put into buses and brought to the camps around the country. Around 11am the demolition of the barracks started – by destroying the basic infrastructure. The first place that was destroyed was the kitchen where people cooked and prepared food over the last 8 months. After that, the workers took valuable stuff out of the barracks, such as cookers, blankets, water tanks and pipes. Photos that were send from the camps showed a sign that threatened people to be deported to Presevo if they dare to show up in Belgrade. By the end of the day, the parks were empty and silent just as the newspapers and media. The eviction was successful, police and Commissariat cheered each other for the good job, thanked volunteers for the cooperation and left the place. 4. Psychological Strategies: In opposition to the eviction that happened last year in August rather confrontatively by using physical violence, this times strategy was more based on communication and psychological violence. With the wave of new volunteers arriving in December 2016 and January 2017 the Commissariat changed its attitude and behavior towards both, migrants and independent volunteers. Whereas before (the few) independent volunteers received a lot of repression, like being photographed, followed in the streets, inquired and taken to the police station, from January this was not the case anymore. The Commissariat was rarely present at the barracks, some of the volunteers didn’t even know that this institution was existing before the decision that the barracks will be evicted was made. The Commissariat, then, played the “Good Cops – Bad Cops” Strategy: as long as the volunteers agreed to cooperate in line with their strategy, they were treated in a friendly manner. Likewise towards migrants. But as soon as there was the slightest resistance against the official policy, they were threatened to get into trouble with both, the Commissariat and the police. Some volunteers had the plan to convince the Commissariat to take the responsibility to register people for the camps in order to avoid that the smuggling structures are taking over too much power. Still, there was no general agreement on this possibility which is why it never happened. Resisting against the eviction, to protest or to monitor, was never an option considered. The volunteers were rather occupied with the question of how to evict the barracks justly and in a humane manner than questioning the strategy or policy behind it. Therefore, the eviction was conducted by a regime of the government, Commissariat, smuggling structures, volunteers and migrants with the use of smart strategies and psychological pressure. From within, it was neither clear who is to blame, to resist, to charge or to trust, nor when and how the eviction will happen – with the effect that there was neither a clear actor to resist against, nor a clear date to organize towards. These are the reasons for the silent eviction of the barracks, for the little resistance, for the little outreach. The era of the barracks is over, the infrastructure that was built over the last months destroyed, the groups who lived in this venue together separated and spread all over Serbia in different camps, the volunteers on their way back to Northern Europe, the people who lived there invisible. 5. Expectations for further developments in Serbia in general, and Belgrade in particular: Although the use of force differed widely, there are many commonalities and parallelities between the eviction of the parks last year and the eviction of the barracks this year. Also in July 2016, people were forced to go to the camps and register there, they were told to stay there and wait for their asylum procedure. Yet, it was only a matter of months that the parks became crowded again. Therefore, it is to be seen – and also somehow expected – that the parks in Belgrade will become crowded again, that people will squat another abandoned houses (and there are many). Belgrade will remain an attractive and important locus of migration and people will continue entering into Serbia. Belgrade in the last years was always more than just a point of transit in hidden. It was also a relatively open metropole, with an economy around the bus- and trainstation that is dependent on migrants. Compared with the much more difficult situation in the South and the North of the Balkanroute, it was a spot that provided a relatively normal life in unusual circumstances. Located between areas of drowning boats, barking and biting dogs, beating police, fences and detention, Belgrade has been for long a somehow absurd relatively “safe island” close to destination. There are just too many motives to come back to Belgrade. Not only because of the infrastructure provided by local and international NGOs, volunteers and smugglers. It is also a feeling of dignity and normality that many people frequently report as a main motivation to stay in the city. Not to forget the political significance of visibility, accessibility and communication that many people made use of. Some people already tried and strolled around the bus station, testing what will happen. They’ve even been checked for passports, but even though they didn’t have any, there were no consequences. Therefore, it is probably just a matter of time that people will come back to Belgrade, that people will squat a house and built up the infrastructure they need and want again.